Rivian Automotive’s electric pickup and SUV will debut later this year at the LA Auto Show. Remember Rivian Automotive? We haven’t heard about the electric startup company since it last year, but now Rivian is preparing to enter the spotlight with the launch of a new electric truck that’s faster than a Ferrari and more capable than a Tesla Model X. Described as an “electric adventure vehicle,” the truck will arrive in two forms: a five-passenger pickup and a seven-passenger SUV. Both will be shown for the first time at the LA Auto Show in November before entering production next year. According to , the electric pickup will be called the A1T, while the SUV will be named the A1C. Rivian plans to launch the A1T in 2020, with the A1T to follow a year later. While neither model has been revealed yet, Rivian’s CEO RJ Scaringe is making some bold claims. According to the CEO, the AT1 will accelerate from 0-62 mph in 2.8 seconds, be able to wade through 3.6 feet of water and have more than 14.1 inches of ground clearance. He also said the truck will be stiffer than a supercar. "There are only a few cars in the world that are going to be as fast as ours, and we have a large five-passenger truck," he said. 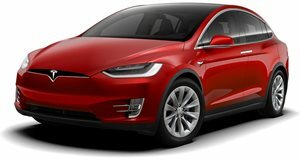 Details are still being finalized, but the base A1T will reportedly cost around $50,000 and have an 80 kWh battery pack providing around 200 miles of range and be capable of hitting 0-62 mph in “less than five seconds.” The range-topping A1T, on the other hand, could cost $90,000 and feature an 800-hp electric motor. Rivian also claims the range-topping model will have a range of 450 miles on a single charge. No photos of either model have been released yet, but says the A1T looks like a vehicle out of the Halo video game series, so expect it to look extreme. Apparently, its shape and size looks more like a Honda Ridgeline than an F-150, but with “aggressive angles and big, blocky panels sitting atop the four meaty tires.” Scaringe isn't a fan of the Tesla Model X either, calling it the "least capable SUV ever made." After all, you wouldn't take a Model X for a gruelling off-road adventure for the weekend, but the CEO wants to fill that void with Rivian's upcoming electric vehicles.